The Metropolitan Opera’s new tagline, ‘The Voice Must be Heard,” was on bright display Monday night when, at the center of the company’s revival of Puccini’s La bohème, one found the rich and layered talent of Angel Blue. 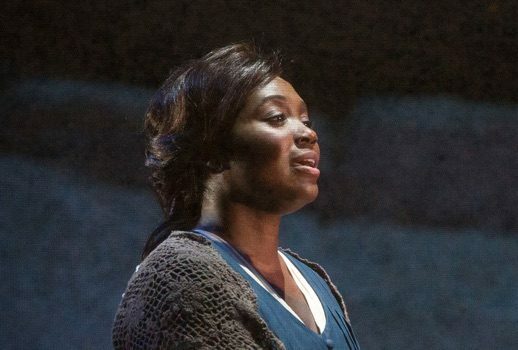 In her debut at the house, Blue sang with a consistent, shimmering soprano that was both vocally secure and emotionally engaging; it conveyed through controlled phrasing her character’s psychology and stark affective trajectory. Blue’s Mimì exuded a celestial warmth, embodying a preternatural innocence without relying on cliché or hackneyed gestures. Such qualities made her an ideal musician for the role of Mimì. In her voice, the opera’s text seemed to resuscitate and expand. If only her colleagues performed with equal facility. Unfortunately, Blue’s remarkable gifts often outweighed and overwhelmed her most important partner—Dmytro Popov, as Rodolfo. This was especially evident during Act I. While Blue’s “Sì, mi chiamano Mimì” displayed exceptional musical polish, Popov struggled through the more demanding passages of “Che gelida manina.” He strained when singing above the passaggio. He did not deliver an acceptable high C. As a result, the scene’s overall effect was disappointing and anticlimactic. Similarly, Brigitta Kele flubbed her big moment in Act II. The singer looked perfectly coquettish as Musetta, but she sounded shrill while attempting notes above the staff. Moreover, her screeched high B in “Musetta’s Waltz” did not diminish to piano, as the composer’s dynamic markings indicate. Fortunately, as Marcello, Lucas Meachem provided some necessary drama with his round, robust baritone. Duncan Rock (in his debut) and David Soar were affable and adequate as Schaunard and Colline; they added nothing special to the proceedings. However, their consistent, comprehensive performances brought a limber, spontaneous element to an uneven ensemble. Similarly, Paul Plishka was unexceptional as both Benoit and Alcindoro. Alexander Soddy coaxed from the Metropolitan Opera Orchestra all the romance and grandeur the score affords. The precision and dexterity with which they played especially illuminated Mimi’s Act III aria, “Donde lieta uscì”—a performance of startling grandeur. To be sure, if there was any reason to recommend this performance, it was Blue—her voice indeed must be heard. Otherwise, once again to encounter this redundant iteration of the opera, with its nostalgic embellishments and overreliance on supernumeraries, is to risk having a seizure. While Franco Zeffirelli’s production might have provoked feelings of awe and wistfulness when it debuted over thirty-five years ago, it seemed ridiculously repetitive and stale on Monday night. It failed to make the opera’s more urgent claims clear; and it especially miscarried any attempt to tend to our culture’s current concerns regarding poverty, disease, and art. Why the company continues to cling to this superficial, mawkish laziness is beyond me. Some might argue consistent ticket sales as justification for the same old Bohème, season after season. As the Met struggles to find new audiences, it is, perhaps, financially risky to mess with some of the more trusty warhorses—its vertiginous and bloated Bohème being the tacky crown jewel of such repertory. His pragmatic argument continued, “The only thing (if anything) distinguishing one Turandot revival from the following year’s is the singers.” The same could be said, even more fervently, of the company’s Bohème. Year after year, the same old thing—all that changes is the cast. When a performance features singers as talented and charismatic as Blue, then there’s little to complain about—however, when the voices fail, the proceedings become exponentially drearier. Yes, the voice must be heard; by all means, sing out Louise. But to borrow Wagner’s application of the term Gesamtkunstwerk, opera is a medium (like film) that has many components, operating on several levels of communication and sensual cognition. Why not explore every tool in the toolbox? Such mismanagement of the company’s resources suggests (once again) that the Met’s artistic leadership has a fundamental misunderstanding of the product they are selling.